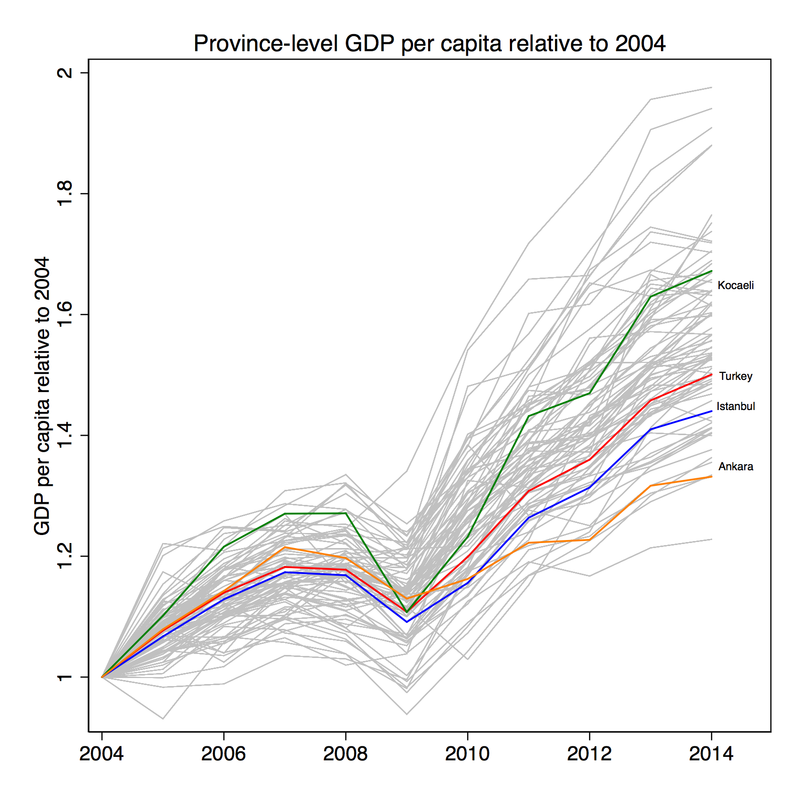 As for the evolution of GDP per capita over time, the below graph plots the province-level values (deflated by the World Bank’s GDP deflator) indexed to their corresponding 2004 values. Interestingly, Kocaeli, has preformed rather well, whereas Ankara has growth the second-slowest of all provinces. This graph shows amongst others the severity of the 2008/2009 crisis overall, as well as the sharp fall and subsequent sharp increase in GDP per capita in Kocaeli. In order to illustrate more clearly how individual provinces fared during the entire period, the below graph shows the growth rate in GDP per capita over the whole period 2004-2014, as well as two periods 2004-2009 and 2009-2014, by province. The left hand graph shows unadjusted growth rates, whereas the right-hand side graph adjusts the growth rates for the 2004 level of GDP ( in order to partial out convergence-driven growth). As seen in the left-hand graph the period 2004-2009 exhibited lower growth rates than the subsequent 2009-2014 period (illustrated by the red dots lying more to the right of the red ones overall). Among the highest growing provinces are several small southeastern provinces, such as Siirt, Mardin, and Bingol. It is not surprising to see smaller provinces growing faster, as this is likely driven by forces of convergence, but even when one adjusts for the initial level of GDP per capita, this provinces still performed rather well. One obvious difference between Siirt and Bitlis at the top of the growth ranking and Batman and Hakkari who are at the lower end of it, is that the former voted predominantly for the AKP, at least up until June 2015 (when Siirt and Bitlis produced two of the largest vote swings away from AKP that election). Similarily, pro-AKP provindes like Rize and Trabzon appear in the upper end with CHP-voting Denizli and Tekirdag closer to the bottom. Is this a coincidence or could it be that AKP voting predicts growth? As for the set of controls I use the variables already included in Turkstat’s province-level GDP data, namely the level of GDP per capita, population, the GDP shares of the agriculture and industry sectors respectively, and geographic fixed effects for whether the province is in the west, east, south, or north of the country. The below matrix graph shows a number of bivariate relationships being non-linear (in particular that between the AKP vote share in 2002 and both log GDP per capita in 2004 and industry share of output in 2004 respectively). For this reason I include quartile dummy variables for each of the plotted variables, allowing their correlations between the outcome and other explanatory variables to be non-linear. Below, I show results from the growth regressions for three periods: 2004-2014, 2004-2009, and 2009-2014. 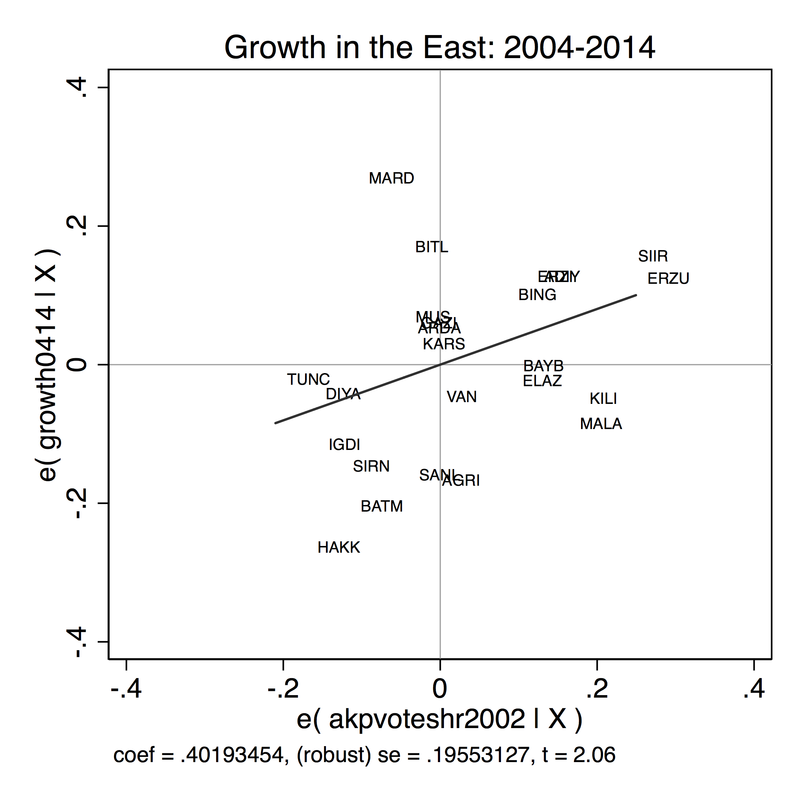 Clearly, the results using the growth rate for the whole period hides the fact that it’s really in the first five years one observes a strong partial correlation between the 2002 AKP vote share and subsequent growth in GDP per capita, where a one percent increase in the vote share corresponds to a quarter of a percentage point increase in GDP per capita growth. In the second five-year period, the relationship is almost completely flat. 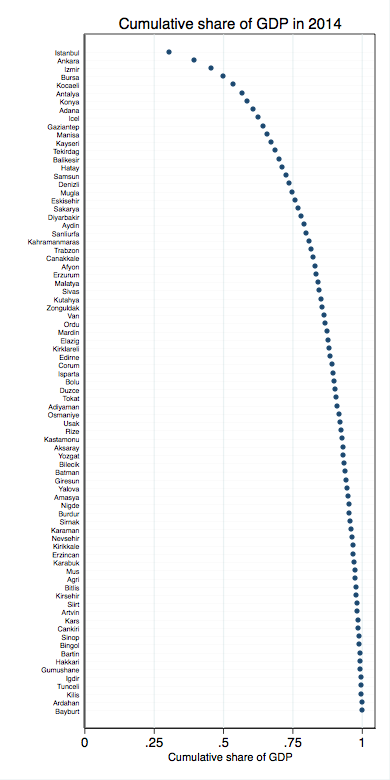 There is furthermore no strong correlation between AKP vote share in 2002 and the 2004 level of GDP per capita. The estimates for the full period as well as the 2004-2009 period are of medium magnitude: a one standard deviation increase in the AKP vote share, 13 percent, is correlated with a 2.6 percentage point higher growth during the period. Given that the standard deviation in the growth rate was 7.2 percent, such a vote swing would have had a meaningful bearing on economic performance. 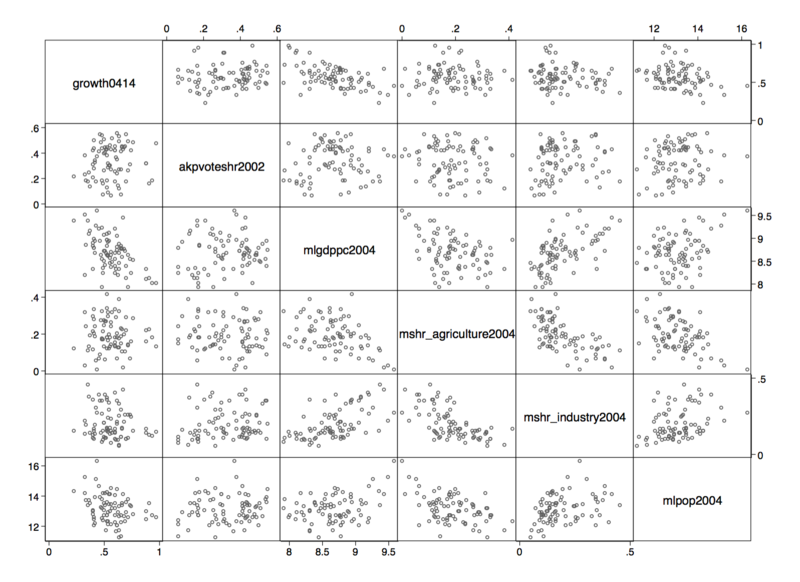 These are merely partial correlations, and require strong assumptions to be interpreted as causal. There may very well be unobserved factors that correlate with both the political outcomes in the 2002 elections and subsequent growth performance that the model does not take into account. It is noteworthy that several southeastern provinces appear to have significant pull on the regression line. Siirt, for example, experienced a higher-than-predicted (by the model) vote share for the AKP as well as higher-than predicted growth for the entire period. In contrast, both Batman, Hakkari, and Sirnak had the opposite experience. To see this more clearly I reran the growth regression only including the 24 provinces in the east (and using only linear controls to not soak up all degrees of freedom). 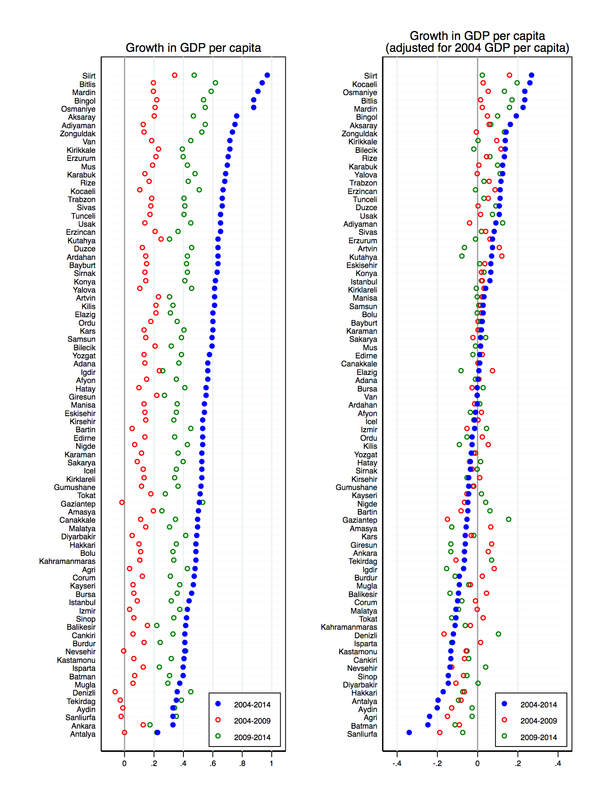 The below graph shows that the partial correlations are quite pronounced even for the subset of eastern provinces in Turkey. One (at this point speculative) interpretation of the overall results could be that the AKP in the early period focused on making sure the provinces that voted for it did as well as possible, or that the provinces that voted for AKP in 2002 also came out of the financial crisis relatively unscathed. In the later periods, as AKP seeks to grow its electoral base outside its core geographic constituencies, more resources might have been allocated to provinces in order to attract voters, partly at the expense of its existing core regions. Moreover, if voters from swing provinces observed in the later period that their previous support for the AKP hadn’t resulted in comparably higher growth, this may have contributed to the shift away from the government in the June 2015 elections (pointing to an economic as well as political reason for abandoning the AKP in the southeast).